Let the tomato season begin! Until today, my vegetable garden was teasing me with little cherry tomatoes called Mexican Midget and another small tomato variety called Tomataberry. Mexican Midget tomatoes are good, but Tomatoberry is so-so. Those are the little ones in the picture. Then this morning -- ta da! Big tomatoes! I've already followed all the required rituals for the first big tomato of the season and ate that one in the upper right in the photo above. (Warning: That link to the first tomato ritual information might frighten some people, so click on it only if you... never mind... click at your own risk). The variety of this first big ripe tomato is... oh no! That vine didn't have a tag on it. Oh, dear. How sloppy of me. I can assure you, though, that even nameless it was delicious, juicy and tomato-y beyond belief. I almost wept as I ate it, it was so good. I also don't know the other varieties of big tomatoes that I picked, other than the pink one in the upper left is German Johnson. It needs a day on the counter to juice up a little and then I will eat it very slowly because it is one of my all-time must-grow-it-every-year favorites. The reason I picked it a day or so early was because it was low on the vine, within reach of critters. I sure didn't want to chance having one of the rabbits or squirrels or raccoons eat my German Johnson tomato tomorrow morning after I dream all day about picking it and eating in the evening for supper. At least this way, my first beloved German Johnson tomato is safe. I do love my tomatoes fresh from the garden and am delighted to post them today as part of Your Small Kitchen Garden's meme Post Produce, which takes place on the 22nd of the month. I am also picking peppers, cucumbers, and zucchini squash. In fact, I just baked a zucchini pie this morning, good for breakfast, lunch, and/or dinner. Pair it up with some fresh tomatoes from the garden, and as I like to say, "that's good eats". Now with Your Small Kitchen Garden'sPost Produce meme, I feel challenged to figure out how to have produce, or something I grew to eat, every month of the year, just as I challenged myself to have flowers nearly every month of the year for Garden Bloggers' Bloom Day. The winter months will be a challenge, but I think I'm going for it. After all, I could grow sprouts, right? What are you harvesting from your garden today? The critters have gotten all the strawberries so far. Great tomatoes.... of varying sizes. I had a look at our plants, only 4 tomatoes, still green. Dang, I wish I'd planted tomatoes this spring. No biggie ... I'm told it's time to plant a fall tomato crop! Great looking tomatoes!!! We were happy to see ours ripening this week as well. I'm so jealous ... but perhaps only a few days behind your in the tomato department. 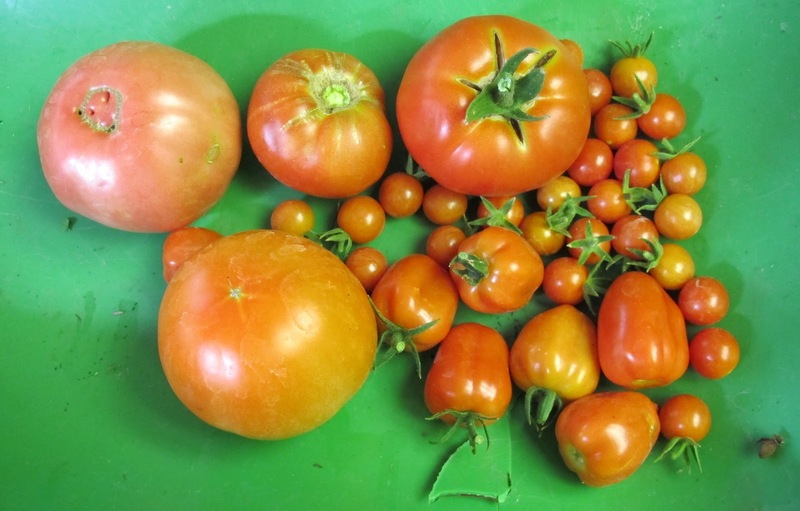 There are two Black Krim tomatoes ripening on my dining room table; rain over the past three days started tomato skins splitting which is a sure sign the tomatoes are ripening. Will probably add German Johnson to my "try it" list. So far my "grow some or cry later" list has only one variety on it, and I'm not sure of the variety's name (though I suspect it's an Andes tomato). It was a pleasure to read about your food. Thanks for participating in Post Produce! I have a small garden so only planted 2 tomatoes, a yellow cherry and a red which I was surprised to find out was a Roma. Well, the yellow is doing so-so, but the roma has turned out to be prolific: I counted 60 green tomatoes which are now starting to ripen, and now the heat has somewhat abated it is setting fruit again. I had a few other things, but the notable ones for their super performance have been clemson spineless okra and collard greens. Next year I will plant one less collard and some more okra. My garden has been almost pest free, so I am very happy with it. I've picked lots of little orange grape tomatoes. Very sweet! I planted a@Mr. Sstripey", which is an Heirloom.I've picked two. Like candy! I also have an Early Girl, which is also good. there is nothing tpo compare with vine ripened tomatoes! homegrown tomatoes are theeeee best! winter bloom idea....I over-wintered my lantana indoors in front of our patio door last year. I had a few tiny blooms off and on all winter!